It is all the more remarkable that A. A. Milne, so great an admirer of this excellent book [The Wind in the Willows] should have prefaced to his dramatized version a "whimsical" opening in which a child is seen telephoning with a daffodil. Or perhaps it is not very remarkable, for a perceptive admirer (as distinct from a great admirer) of the book would never have attempted to dramatize it. Sometime in the 1990s I was at a party. A friend was passing round pieces of gourmet chocolate. You know the kind of thing, 85% cocoa and a dash of sea salt. "That looks lovely" said another guest "But could I have a piece of milk chocolate instead? You see, I am trying to reduce my caffeine intake." "Oh, is the dark chocolate stronger?" asked my host. "No" I chipped in. "Not stronger. Quicker. Easier. More seductive." I know for a fact this happened in the 90s, because opportunities like that only come once in a decade. At some point in the 80s I had witnessed someone throwing a piece of cooked potato across a take-away fried fish emporium, such that it struck a lady customer, who was I recall wearing rather a low cut dress, just above breast. "Madam" I had the opportunity to say "You have a chip on your shoulder." And it is one of the great disappointments of my life that when, in or about 2005, staying in a village where some cottager kept poultry in his garden, I observed a chicken attempting to cross the road there was no-one was in ear-shot when I wondered out loud about her motivation. Shadows of the Empire (one of the few extended universe novels I have tackled) seemed to do basically the same joke without noticing that it was funny. It was mainly about plumbing. We keep being told that water is being pumped into reptilian gangster Prince Xizor's bath, at great expense. When Luke arrives at Ben's hovel to construct a lightsaber, the first thing he does is takes a shower. I don't think that mysterious gurus living alone on desert planets have modern, or indeed futuristic, sanitary equipment in their hovels. I think they probably roll naked in the sand once a year, or go down to the creek to do their necessaries. Or maybe there is a very macho bath-house in Mos Eisley? The truth is Obi-Wan doesn't ever need a shower. He's an archetype, or at any rate an action figure. He never gets smelly. It would be like asking if Aslan ever goes to the dentist. And then our heroes gain access to the baddies base via the sewerage system. Via the sewerage system. Big rubbish dumps with hideous one eyed squid monsters hiding at the bottom I can cope with. But sewers. Implying that archetypes and action figures sometimes need a poo? Do you not understand how this stuff works? Star Wars characters doing things which are out of genre. Star Wars characters placed alongside people from a different genre. Lines from Star Wars being quoted in inappropriate contexts. Imagine 60 pages of that, with, admittedly, rather charming illustrations, and you have Darth Vader and Son and it's sequel Vader's Little Princess. You can read both of them in the time it took you to get to this point in my essay. They are very popular. I don't get them at all. The "idea" behind the books is that the Darth Vader of the films is also playing Dad to Luke Skywalker — which is to say, to a little boy who looks a bit like a pint-sized Luke Skywalker. (Obviously there is no point of departure in the movies at which Vader could have been Dad to Luke. As soon as he knows he exists he wants to kill him.) The sequel starts out as if it is going to do all the same jokes again only with a little girl who looks a bit like a pint-sized Princess Leia, but realizes that's scraping things a bit, and ages her into a teenager half way through. Not that Leia was much more than a teenager. So we have basically three "jokes". 1: Darth Vader acts like a Dad and Luke or Leia act like kids. e.g Princess Leia is brushing her teeth, and Darth Vader is saying "Make sure you get the backs." 2: Darth Vader acts like Darth Vader, while Luke or Leia behave like kids. 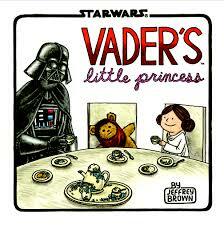 e.g Vader is about to Force strangle an admiral, while Leia tugs on his trouser leg saying "I love you, Daddy." 3: Darth Vader acts like a Dad and Luke or Leia act like kids but Vader says a famous Vader line out of context. e.g Luke is wining "you said we could go to Tosche station after nap!" and Vader responds "I am altering the deal. Pray I don't alter it any further." 4: Something happens which either is, or strongly resembles, a scene out of one of the movies, but Darth Vader acts like a Dad. e.g Luke is hanging from the bridge thing in Cloud City and Vader says "Come down from there, it's dangerous." Literally, that's the whole book. I don't know if it is intrinsically funny to take an ordinary American father and son and re-skin them as an archetypal Father and Son. I recall that someone did something along the same lines with God and Jesus once. I also recall that that wasn't particularly funny. I suppose it is interesting that the main thing that a non-geek audience can be expected to know about Darth Vader and Luke Skywalker is that the one is the other's father. Or else that there is no limit to what a geek audience will spend money on. A lot of Star Wars lore is taken for granted and worn lightly — when Luke goes to the zoo, we see a bantha, a dewback, a rancor and the salaac in cages, and there's a cute scene in a toyshop with Luke surrounded by toys in classic era Star Wars toy packaging. That actual joke was very nearly in Phantom Menace. A few years ago, there was a fad for Winnie-the-Pooh t-shirts and fashion items, with the various characters reduced to the minimum possible number of pencil lines. It struck me as an interesting take on the idea of ideas and memes. A real little boy has a real toy; a proper artist draws a realistic picture of that toy in a book. A cartoon artist takes the proper artists drawing, simplifies it, and colours it in. Years later, another artist takes the cartoon, reduces it to the simplest number of lines possible, and put it on a t-shirt, and it's still instantly recognizable. But no longer really a picture of anything: "Winnie-the-Pooh" is just an image, detached from Disney and Shepard and certainly from any toy actually owned by C.R Milne. So is Hello Kitty and Mickey Mouse. Is there a process in play where "Darth Vader" has stopped being a character in a movie and becomes simply a shape? HogwartsJedi Academy. At first, he finds it hard to cope (everyone else having started when they were little kids: this book cares quite a lot about continuity) but by playing to his strengths and making friends, he stops dreaming of being a pilot and decides he wants to be a Jedi. The jokes are structurally the same as in Darth Vader and Son. Ordinary things happen but are given a Star Warsy twist; Star Warsy things happen but are treated as if they are quite ordinary. Roan records funny things his various teachers have said. In the case of Kitmum, the Wookie PE teacher, these include "Rwoaar!" and "Rawarr!" 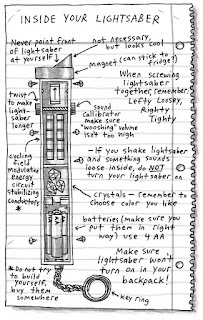 There is a diagram of a lightsaber, with a space for 4 AA batteries ("remember to put them in the right way"). There has been a spate of middle-school observational comedy books, mostly in journal format. Children can't get enough of them, but they have zero cross-over appeal. Adults can relate to old-fashioned boarding school stories, with or without the addition of magic; but in order to laugh at jokes about changing rooms and cafeterias you have to still be a kid, Wimpy or otherwise. (British kids laugh at the American school jokes, though: I guess adolescent embarrassment is adolescent embarrassment, wherever you live.) Whether the joke still works in an imaginary school, I couldn't say. At one level, we are supposed to be treating it seriously as a sub-Star Wars story: I think we are supposed to punch the air with pleasure when Roan finally manages to use the Force to levitate five or six huge boulders. (NOTE: I didn't.) At another, it seems to be laughing at the whole idea of Star Wars. Yoda's "Try not. Do. Or do not. There is no try" in Empire Strike Back is a nice enough mini-midget aphorism about the importance of self-confidence. But if you say it over and over again, it appear to be funny. The mysterious old mentor who lives in a far away swamp has morphs far too easily into the dotty old codger who spouts a lot of nonsense. The book is at its most engaging when it forgets that it's a Star Wars riff and just talks about being a kid. --Have you ever kissed a girl? --None of us have ever actually kissed anyone, have we? When I was Roan's age, I had a record. Record's were like CD's only big and black and crackly. This one was blue. It had a booklet with pages and pages of photos. The Story of Star Wars it was called. I suppose it had about 50% of the dialogue from the film, with a spoken narration. Apparently, it was only semi-official: approved by Lucas, but royalty free. Out of that speech was built Yoda in the Swamp, making Luke face Vader in a gnarly old tree. 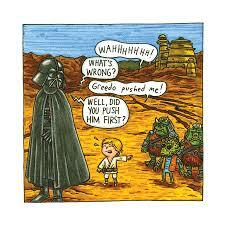 Our of Yoda in the swamp was built the younglings, patiently attending lightsaber class on Coruscant. (And out of that scene to the five Younglings being taken to the planet Kiros to choose their wands, sorry, did I say wands, I meant lightsabers.) And out of that scene, somehow, this. 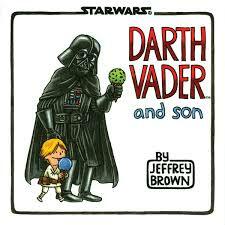 Jeffrey Brown is a Star Wars fan. Jeffrey Brown, I am sure, played Ben's speech over and over again. I am sure that when Ben gives Luke the lightsaber for the first time, he also wanted to reach through the screen, grasp it, and keep it forever. "LIGHTSABER FENCING TOURNAMENT. Tryouts next week. Five positions available for each squad. Squad A will be coached by Master Yoda. Squad B will be coached by Mr Garfield. Squad C will seit in the bleachers and cheer for everyone. Watch out for sparks though. 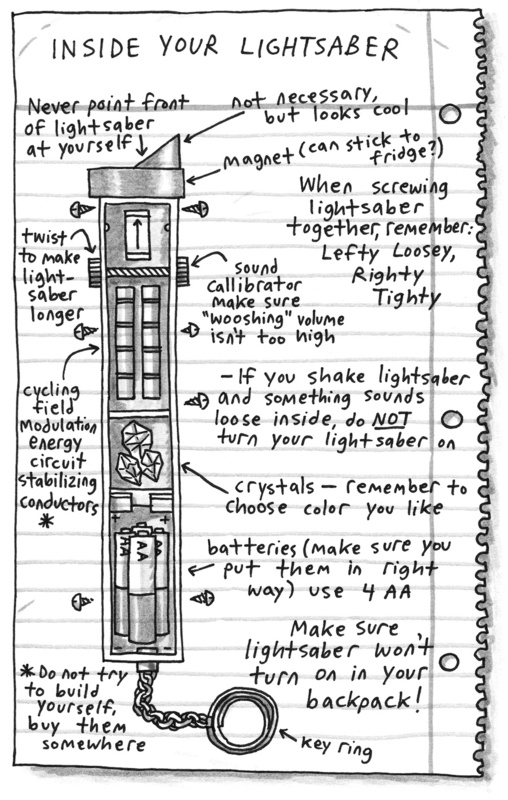 DON'T FORGET YOUR LIGHTSABER." 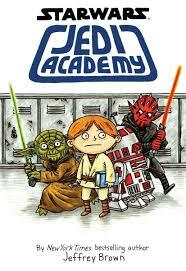 And I wonder if there are younglings, even now, reading Jeffrey Brown's engaging, witty book, without having seen A New Hope or even The Phantom Menace? And how many years it will be before they realize what has been stolen from them? If about lightsabers in P.E lesson first you hear, to Obi-Wan Kenobi's cave go never you will. A long time ago, I wrote down everything I know about Star Wars and put it in a book. It would be lovely if some of you read it.